The Hawaii congresswoman has repeatedly shifted her rhetoric on Iran. But when she calls herself a “hawk,” believe her. There have long been two Tulsi Gabbards. There’s the progressive Hawaiian legislator who is to the left of many of her colleagues on domestic issues like health care and climate change and speaks reverently of Islam; and there’s the Tulsi Gabbard who seems to eagerly take up right-wing, sometimes Islamophobic, talking points. There’s the Tulsi Gabbard who is a staunch enemy of war and champion of diplomacy, heedless of the vitriol aimed at her for it; and the Tulsi Gabbard who calls herself a “hawk,” thinks ISIS is America’s most pressing threat, and that terrorism can only be defeated through more bombs and bullets. And there’s the Tulsi Gabbard who believes the Iran Deal was a “high water mark for diplomacy” with the country; and the Tulsi Gabbard who relentlessly trashed diplomatic rapprochement with Iran for years. Last year, I wrote a piece outlining numerous disquieting elements of Tulsi Gabbard’s record; since the announcement of her presidential campaign, the article has gained renewed attention. At the time, the congresswoman from Hawaii was the object of much admiration from the Left for her fairly early endorsement of Bernie Sanders, and the idea of the piece was to better inform left-wing and even liberal readers about the lesser-known, but seriously concerning, aspects of her record: aspects like the fact that her foreign policy is not nearly as antiwar as she claims it to be, that she supports various authoritarian, nationalist leaders, and spent a significant amount of time prior to 2016 winking at the increasingly Trumpian right. Over the weekend, Michael Tracey took exception to the piece, in particular my account of Gabbard’s well-documented hostility throughout 2015 toward Obama’s Iran Deal, a diplomatic success of his presidency that Trump made it his mission to shred once in office (which he has). Tracey pointed out, correctly, that I neglected to mention Gabbard voted for a September 2015 resolution in favor of the Iran Deal, a measure that all but one of the Republicans present voted against, with the support of only twenty-five Democrats. He argued that fact contradicted the claim in the article that Gabbard “vigorously opposed” the agreement. It’s certainly an important bit of context that should have been included in the original article. But a closer examination of Gabbard’s stance toward Iran before that point reveals a lengthy, well-documented history of hostility toward Iran and diplomacy with the country. In June 2013, a sea change in Iran-US relations took place. Iranians elected as president the reformist-backed Hassan Rouhani, a former nuclear negotiator respected by international diplomats who wanted to end the impasse over Iran’s nuclear program, reestablish relations with the West, and find a way to ease the sanctions crushing the country’s economy. The Obama White House responded that it “remains ready to engage the Iranian government directly” for a diplomatic settlement. The Iranian government, for its part, relayed a message to the Obama administration that Rouhani wanted direct negotiations with the US over its nuclear program. It was the best opportunity for finding a diplomatic solution to the standoff in years. The fact that most Democrats — indeed most of the House — voted for the bill doesn’t make Gabbard exceptional within a hawkish Democratic Party. But it hardly tracks with her image as a trailblazing rebel rejecting national security orthodoxy. Gabbard had a habit of repeating common national security establishment tropes on the issue. She suggested at one point that in Yemen, Iran had “ground that they are controlling,” suggesting that the Houthi rebels in the country are merely the country’s puppets, a highly contested assumption to say the least. In 2014, she called Iran “the world’s leading state sponsor of terrorism.” By contrast, a year later, when asked about the potential for Saudi Arabia to develop nuclear weapons in response to a potential Iranian nuclear arsenal, she said it was “understandable” because Iran was “right on their doorstep.” Bear in mind that Saudi Arabia has been connected in varying degrees to terrorists over the past few decades, including through its involvement in the September 11 attacks, while Iran is both encircled by one nuclear power at the same time as its chief regional adversary also secretly owns as many as hundreds of nukes. Gabbard’s response was standard tough-on-terror messaging at the time, when there were increasing calls for the government to “silence” terrorist propaganda online. Now, of course, it’s not terrorism but panic over “fake news” and “bots” that serves as justification for censorship of social media and the web. Then there’s 2015, the year of the Iran deal itself. Steve Bannon’s Breitbart loved quoting the representative about her dire concerns over the agreement. The National Review also loved her for having “taken the administration to task over its recent rapprochement with Iran.” She went on Fox News and appeared to agree with Greta Van Susteren that the deal was akin to the infamous Munich Pact. When Iran’s political rivals in the Gulf snubbed Obama at a planned Camp David summit in protest of the Iran Deal, Gabbard explained that their concern was “the same concern we all share.” At the same time the pro-Israel lobbying group AIPAC was strategizing and spending tens of millions of dollars to defeat the agreement — to the point where Obama sent two of his aides to speak at that year’s AIPAC conference to offer a counterpoint to its anti-Iran Deal programming — Gabbard was one of the speakers at the conference. (The content of the speech is nowhere to be found). Granted, it’s a long list of speakers, but you won’t find any other current Democratic front-runners who appear on it. 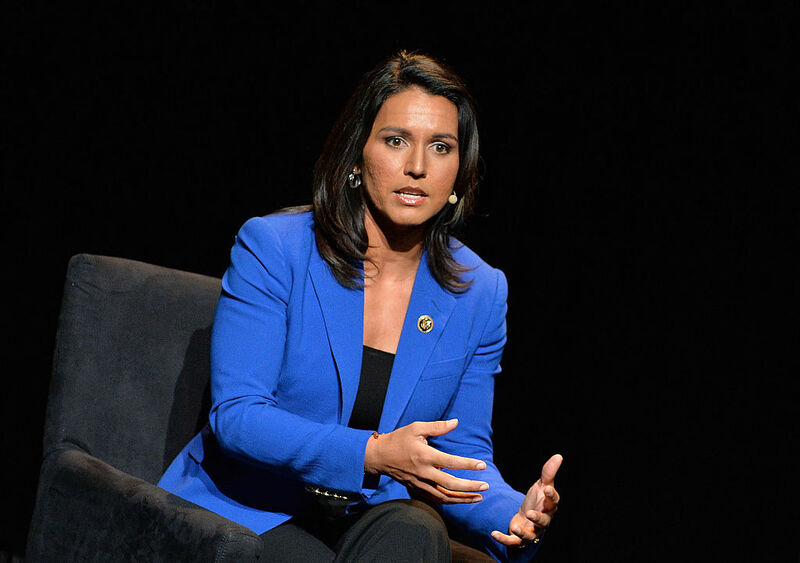 Gabbard will also stand out on the Democratic debate stage for having attended Netanyahu’s fear-mongering March 2015 speech to Congress against the Iran Deal. At the time, Netanyahu’s speech was viewed as a combination of personal insult to Obama, unprecedented foreign interference in US government policy, and an act of wrongheaded, aggressive foreign policy. Two months later, Gabbard voted for the Iran Nuclear Agreement Review Act of 2015. It was a Republican-favored piece of legislation that gave the GOP-controlled Congress more power to derail the agreement, and was opposed by Obama, partly for that reason and partly for its potential to damage negotiations with Iran. Among other things, the bill introduced the requirement of mandatory presidential certification of Iranian compliance every ninety days, which Trump has continually dangled like a blade on a pendulum over Iran’s leadership after taking office. Again, Gabbard’s vote here doesn’t make her unique — 176 other Democrats voted in favor of the bill. But that’s exactly the problem. After all of this, come September of 2015, Gabbard abruptly shifted course and voted for a resolution supporting the Iran Deal — a symbolic vote that had no impact on Obama being able to actually implement the deal (indeed, the resolution was defeated). Even then, as Gabbard explained, she hadn’t voted for it “because it’s a great deal, or even a good deal,” but because over the preceding weeks, she decided it was the best of a set of bad options. She added that the deal didn’t prevent the US “from taking unilateral or cooperative action against Iran,” nor did it “take the military option off the table.” It’s a curious stance for a politician now marketing herself as a peace candidate. Gabbard did also vote against several other Republican bills opposed to the deal, but these were also not serious attempts to shred the agreement, given that such efforts were dead in the water in the Senate. It’s worth noting, too, that by September, there was a full-court press from Democratic Party leadership to put up a united front in favor of what was shaping up to be one of their president’s major achievements. We might also speculate about the effect of the Democratic base’s increasing disgruntlement at the time with the hawkishness of Hillary Clinton, another politician who was voicing skepticism toward the Iran Deal and insisting the US should “not hesitate to take military action” if Iran sought to obtain a nuke. (Gabbard endorsed Sanders for president five months later). Of course, Gabbard is now firmly in support of the agreement. And her language has changed markedly. Just read this October 2017 op-ed, in which she urges Trump to stay in the agreement to “demonstrate our commitment to peace and diplomacy to Iran and to the rest of the world,” and (correctly) puts Iran’s supposed nuclear ambitions in the context of historical US meddling in the country and threats of war. What are we to make of all this? Gabbard either genuinely opposed the agreement for months before realizing only in the last few weeks that it was the best option available; or she cynically played to the Right by attacking one of Obama’s few signature foreign policy achievements while secretly supporting it all along; or she genuinely opposed the agreement before switching over to support it once the political winds shifted. None of the options reflect particularly well on her. So yes, Tulsi Gabbard vigorously opposed the Iran Deal, until abruptly and reluctantly deciding to support it, under immense political pressure, and in votes that had debatable significance to the deal’s survival. In fact, one could make the case that her proselytizing against it was more significant, helping inculcate American voters with a fear of a nuclear-armed Iran, and contributing to the deal’s yo-yoing fortunes in public approval throughout 2015 and even 2016, where it hit a new low (though it’s of course impossible to measure Gabbard’s exact contribution to this). When the Democratic nominees get up on stage to debate, Gabbard’s foreign policy will still be better than that of many of her more centrist competitors. But there are serious reasons to be skeptical of her bonafides as a peace candidate. When Tulsi Gabbard calls herself a “hawk,” believe her.